Updated from 8:51 a.m. on Friday, July 7, 2016. If it sounds too good to be true, the Better Business Bureau likes to say, it usually is. The slogan, which the consumer services organization once used as the title of a short film about its work, captures the risk of looking only at the surface of June employment data reported by the U.S. Labor Department on Friday, July 7. Payroll growth of 222,000 appears strong, after all, perhaps even spectacular. It's not only 43% more than economists projected, it's a sharp turnaround from May, when gains missed projections significantly and the government pared initial numbers from the previous two months. But examining the granular data behind that number shows several weak spots, in keeping with an economic recovery that has yet to reach all sectors or drive inflation to the Federal Reserve's 2% target. The unemployment rate, which reached a 16-year low of 4.3% in May, ticked up 10 basis points to 4.4% in June as college graduates began seeking employment. Wages climbed just 2.5% from the previous year, trailing projections of 2.6% and an inflation-supporting level of 3%. "The headline number was pretty solid," Joseph Song, an economist with Bank of America Merrill Lynch (BAC - Get Report) , said in a telephone interview. "The details were definitely on the softer end." That may prompt members of the Federal Reserve's monetary policy committee, trying to maintain stable growth and maximum employment while paring stimulus measures established after the 2008 financial crisis, to take a less hawkish tone, Song said. Committee members, who have kept interest rates at nearly zero for seven years after the crisis, have raised them four times since December 2015 to a range of 1 to 1.25%. They have also signaled they will begin this year to trim a balance sheet that ballooned five-fold to $4.5 trillion with the purchase of securities intended to pump liquidity into the economy. The Fed's focus "is going to be on the unemployment rate and wage growth," Song said. "The unemployment rate ticking up suggests there might be a little more slack in the labor market, and less wage pressure building up in the economy." While that may spur the central bank to place less emphasis on the risk of the economy overheating, it's unlikely to stop the Fed from announcing in September that it will start to reduce the amount of maturing government bonds and mortgage-backed securities it reinvests -- or from raising interest rates in December by another 25 basis points, Song said. That would buoy lenders from JPMorgan Chase & Co. (JPM - Get Report) to Wells Fargo & Co. (WFC - Get Report) , which typically benefit from passing increases on more quickly to borrowers than to depositors. A pivotal point in the data is what it shows about the trajectory of employment, Mark Hamrick, Washington bureau chief at Bankrate.com (RATE , said in a telephone interview before the data was announced. 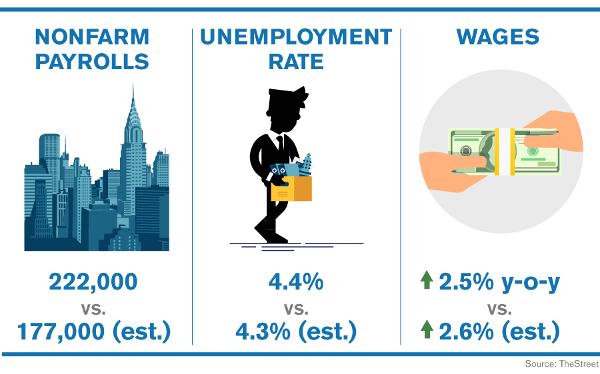 And there were positive indicators on that score, with the Labor Department boosting initial growth estimates for April and May by 47,000, which raised average job gains over the past three months to 194,000. "Hiring is back to where it has been throughout much of the eight-year-old economic expansion," Hamrick said in a note to clients on Friday. "With a June surge in hiring and upward revisions to payroll gains for April and May, the past three months are looking better than what we'd been thinking." Still, growth remains "modest, not spectacular" Hamrick noted, in keeping with a long-running expansion. "The buzz kill on the jobs report is the lack of more substantial wage growth," he added. "This suggests that we've not yet checked off the 'full employment' box, meaning more progress can be extracted from the job market." Indeed, hourly earnings rose only 0.15% in June, and May's initially reported gain was trimmed to 0.1% from 0.2%. Over the past four months, annualized wage growth has slowed to 1.7%, the lowest since 2014, Ted Wieseman, a Morgan Stanley (MS - Get Report) economist, said in a note to clients. And the 2.5% increase in the 12 months through June is significantly lower than a 2.9% high in December, he noted. "Whether wages follow prices more in the U.S. or prices follow wages, both inflation and wage gains have been surprisingly weak this year," Wieseman said. Editor's Pick: This article, which was updated to include Mark Hamrick's title as Washington Bureau Chief for Bankrate.com, was originally published on July 7, 2017.